Austin-based advertising and public relations agency lookthinkmake brought home two awards from Austin’s 2019 American Advertising Awards, also known as the ADDYs, earning recognition for its work with Houston food hall Understory and its City of Austin-funded integrated tourism campaign and interactive things-to-do website ATXLoves. The full-service marketing agency walked away with awards in both logo design and cross-platform marketing, given by a panel of respected judges in the advertising community from around the country as some of Austin’s most exceptional creative advertising in 2018.
lookthinkmake’s work with Houston’s Understory, a new food hall located beneath the Capitol Tower in downtown Houston and developed by Skanska, won a silver award at the 2019 ADDYs for its original brand identity. In late 2017, lookthinkmake began building a logo, company name and brand for the part-restaurant, part-community gathering space from the ground up. The project culminated in Understory’s brand reveal in the summer of 2018, breaking into Houston’s food and restaurant scene with a bang. 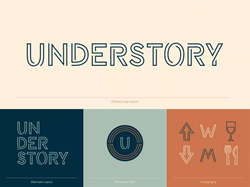 Audiences in Houston responded well to Understory’s brand identity, and the ADDY’s responded in kind by recognizing lookthinkmake with its award for logo design. After several successes with hospitality and tourism advertising campaigns, including Austin’s first food hall Fareground at One Eleven Congress and Key Concierge, lookthinkmake took steps toward the tourism marketing industry, culminating in the ATXLoves integrated marketing campaign in 2018. The city-funded initiative, which encouraged Austin tourists and residents alike to patronize locally-owned small businesses, included an interactive map and guide website conceived of and designed by lookthinkmake. The firm received bronze honors at the 2019 Austin ADDYs for the cross-platform, multimedia campaign rollout which highlighted colorful, bold creative design and smart copywriting in its digital and traditional media buys throughout Austin. The American Advertising Awards, affectionately known as the ADDYs, is the nation’s largest advertising competition and receives yearly entries from nearly every creative, media, public relations and marketing agency in the country in both national and regional chapter submission pools. As one of the largest chapters of the American Advertising Federation in Texas, the Austin American Advertising Awards make for one of the most competitive awards in the state.